Two new placeholders for the first of the BBC's new HD channels have gone live on Freeview HD this morning. 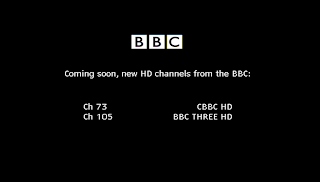 CBBC HD has been added to channel 73 and BBC Three HD to channel 105. Both channels will timeshare the bandwidth currently used by BBC Red Button HD, which is expected to go off air after providing 3D coverage of the Doctor Who 50th anniversary special in November. Both CBBC and BBC Three HD will be universally available on Freeview HD, with 98.5% population coverage. The official launch date for these services is yet to be confirmed, but both services are expected to be on air by mid-December. BBC Four HD, CBeebies HD and BBC News HD are also scheduled to launch soon, but due to capacity restraints, will launch on one of the two new Freeview HD extra multiplexes. These extra multiplexes will cover 70% of UK households by the end of June 2014. In London, multiplex operator Arqiva is testing one of the extra multiplexes that will cater for the expanded Freeview HD service from London's Crystal Palace transmitter. Al Jazeera English HD has commenced testing on channel 108 for viewers with Freeview HD receivers in and around the Capital. A rescan may be required to see the test service. Find out more about Freeview and Freeview HD services. I hear that the new BBC HD Channels is set to launch on Virgin Media (and other networks) on December 10th 2013. BBC Three HD to channel 105, Will This Mean Channel 5 HD Will Never launch On Freeview HD? BBC Three HD and CBBC HD will also launch on Freesat. The 10th December date is a date I've known for a while *but it is still unconfirmed*. Alix Pryde (Director, BBC Distribution) will have more to say shortly on this subject. The BBC has no sway over separate commercial arrangements between Sky and other commercial broadcasters. The status of C5HD is a matter for the Department for Culture, Media and Sport (DCMS), who have reviewed the licences for Channel 3 and 5 services in the UK and who are considering changes to the Communications Act 2003. They can't change the encrypted status of Channel 5 HD overnight, but changes to legislation may require the broadcaster to treat the HD service the same as the SD service in return for getting channel 105 for C5HD on the EPG.